Whale watching season is upon us; for the next few months we have the opportunity to view the magic of pods of whales migrating through Costa Rica. There is nothing more impressive and humbling than to be in the presence of a whale breaching the surface. The beauty of seeing a mother whale lumber along and her calf jumping and splashing about. Whales are friendly and curious and often approach near to the boats; it is truly amazing and a life long memory. Watching whales pass through the coastal waters of Costa Rica is one of the special treats that makes visiting the Pacific Coast of Costa Rica so worthwhile. Whales migrate from both the Southern hemisphere from mid July to October and a smaller number of Whales from the Northern Hemisphere from December to mid March. Adventure Hotels of Costa Rica has a number of member hotels in the Osa Peninsula and Central Pacific area with boating tours that offer a chance to experience being in a pod of whales and dolphins. On trips to go snorkeling in Caños Island there are always whales at this time of year. While in Osa Peninsula area enjoy a day trip to Corcovado National Park. Corcovado National Park is one of the most biologically diverse areas of the planet. You’ll see sloth, anteaters, tapir, monkeys, scarlet macaws, trogones, exotic species of frog and much more. 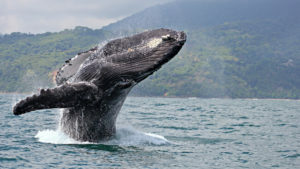 Here are just a few member hotels who offer tours to whale watch, or snorkeling tours to Caños Island which invariably turns into whale watching as well: Lookout Inn in Carate, Guaria de Osa in Drake Bay, Corcovado Adventure Tent Camp, Bella Rosa B&B in Ojochal, Alma de Ojochal, and Espadilla Ocean Club or Tico Tico Villas in Manuel Antonio. 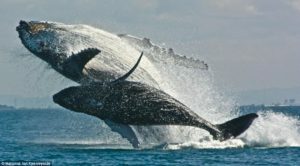 Come visit Costa Rica and enjoy the incredible wildlife; especially the Whale migration!